Do you ever feel overwhelmed by all the toys toys toys in your house?! Today we have a great post that we hope will help you learn how to organize it all. 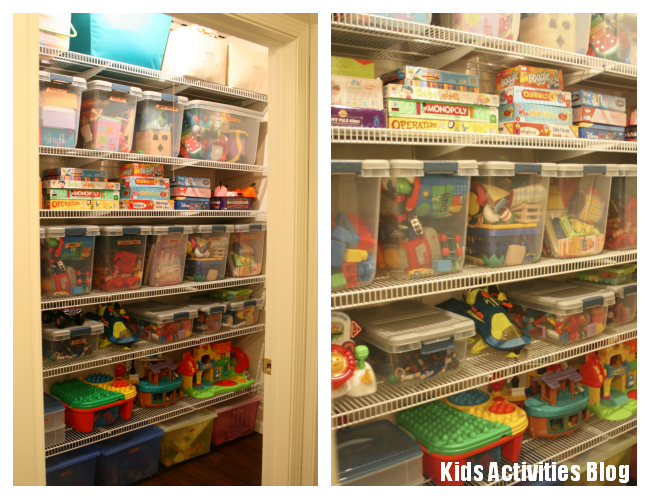 Kids Activities Blog loves neat and clean organization projects like this. They are so inspiring! We have a lot of toys… Let’s be honest, with five kids we have too many toys. As a person who thrives in maintained order and one who struggles with unorganized chaos, I was about to loose my mind over the cluttered mess that was our playroom closet. As we acquired more objects and expanded our family, I tried to keep it clean. As clean as possible with inadequate shelving and a lack of proper bins… but it had continually become a mess. Finally, after months of dreaming of performing a closet makeover, I could no longer stifle my need for organization any longer and I emptied the closet. The end result, in my opinion is swoon worthy. Six shelves and twenty-seven bins later, the playroom closet has been transformed from a waste land of lost toys and misplace puzzle pieces to a fortress of cleanliness and order! Oh how happy am I… how happy am I… I’m extremely happy. I know that It may seem overwhelming at first, especially as you stand on the outside looking in, but I promise that once you get started and see tangible progress, you’ll be encouraged to continue forward with your organization. Go through the toys and make a ‘keep’ and ‘toss’ pile. Decide if you want to rummage or donate. Measure your space and determine how much shelving is needed. Determine how many bins are needed and which ones are best suited for your specific needs. Separate your toys by category for easy organization. Label your bins and fill. Step back in amazement because you did it! Hopefully I have a playroom ready in a couple of months so the Giant Toy Pile is no longer a decoration item in my living room. Thank you for sharing how you did it. Wow, what a fantastic toy closet!! We have our toys pretty well organized in bins too, but it’s nowhere near so nice 🙂 Thanks for linking at the After School linky! What a closet! I love organization so this is very cool. Now, that is definitely a closet to swoon over. I had my grandson staying with me this past week and I told him that for every long shelf he cleared, cleaned and organized, I would pay him $5, for short shelves $3 shelves. He is an amazing organizer and the first thing he did was ask for all different size boxes for containers. He wanted to stack them, but i cut off the tops so I could have one layer that I could look into and get what I wanted. He cleaned 7 shelves and we went to Target for Legos at the end of the week for him to spend his hard-earned money. That looks wonderful. I am trying to get all of the toy madness under control before the holidays. Thanks for the inspiration and sharing this with the Less Laundry, More Linking party. That closet of toys looks amazing! I can’t imagine all those toys being in a huge bin all mixed up. They probably get played with a lot more. 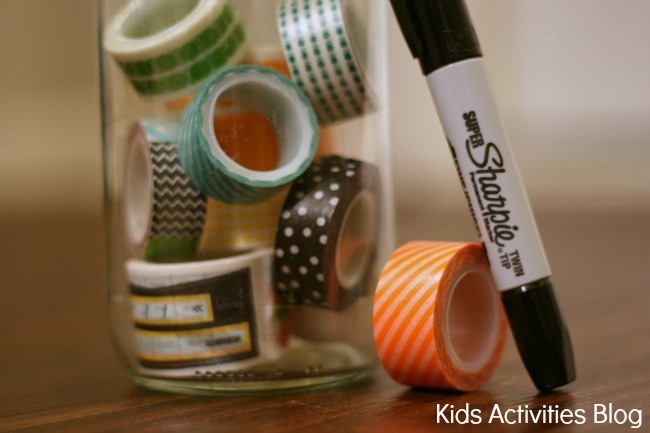 Do you have any tips on getting the kids to keep them organized? Thanks so much for sharing at Mom’s Library! Love the way it looks now – I have a similar issue. Thanks for sharing – featuring at Family Fun Friday! Great tips! Thanks for sharing at Silver Pennies Sundays. Hi Jamie! That’s wonderful .That closet of toys looks amazing and awe – inspiring. 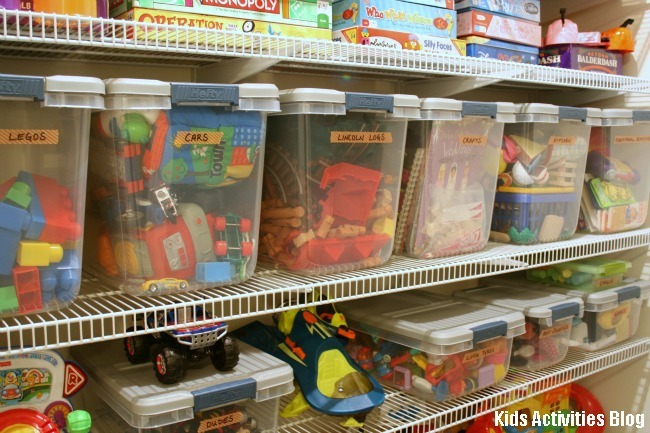 Seperating your toys by category and labelling your bins surely helps in tackling your playroom closet.Thanks a lot for sharing.Cheers! the rotation of the motor shaft.